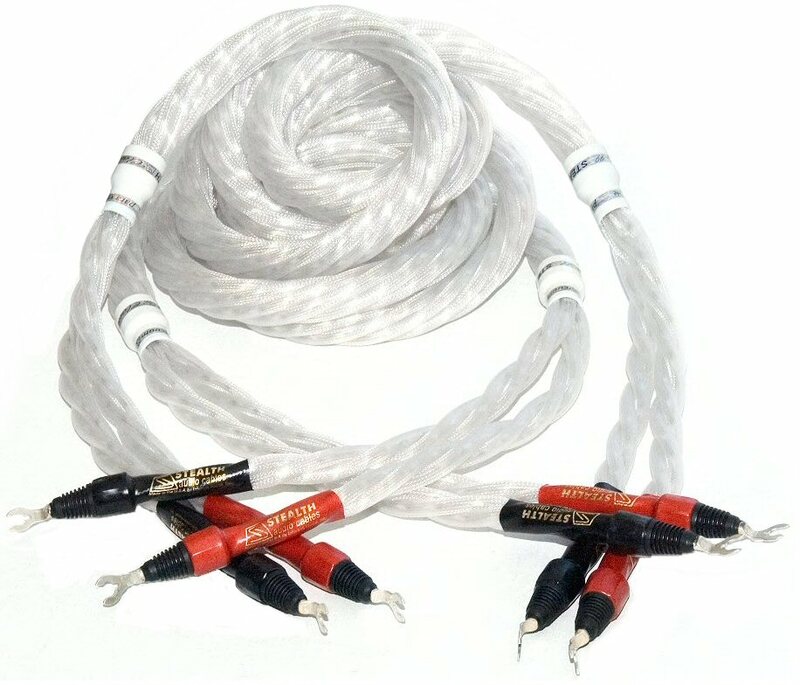 The Cloude 99 speaker cables are similar to the STEALTH Cloude Nine, but the silver is of higher purity (99.997%, versus 99.9% in Cloude Nine), and - most importantly - the dielectric is much more advanced: STEALTH para-vacuum** in Cloude 99 - versus just air in Cloude Nine. Six pure solid silver flat wires (ribbons) spirally braided together and split into two leads (positive and negative) at the ends. The "wire" used to make these cables is solid 99.997% pure silver, flat single core conductor 3/16 inch wide and 0.01 inch thick. No solid dielectric is used - at least, in the conventional sense: each of the silver ribbons is gently spiraled inside a flexible (but strong) transparent Helium filled 1/4 inches OD tubing (STEALTH para-vacuum technology**). The tubing touches only the very thin edges of the silver wire, and the flat part of the wire is surrounded by Helium only; each tube is strictly air tight to prevent Helium from leaking out and preserve the silver from oxidation.. When such construction is measured, the dielectric constant is very close to 1.0 - (vacuum) - and the closest up, solid Teflon, being 2.2 to 2.5 depending on the Teflon type (all other known solid dielectric have higher constants; the closer the dielectric constant to 1.0 - the better for the subjective "speed" perception). Cloude 99' sound is VERY "fast", transparent and clear, with good bottom and top ends extension, and lots of subjective "air". The Cloude 99 work well with all types of music, but they especially shine on vocals. ** STEALTH para-vacuum tube is a hermetically sealed flexible tube filled with Helium; fist, Helium is approximately 15 times lighter than air, and therefore its energy storage properties are extremely good: about equal to that of a 15-fold vacuum; the dielectric properties of such environment are even better: Helium is inert and has no ozone or other ionized molecules, and therefore there are absolutely no leaks of any kind - and this is better than any realistic vacuum. In addition, being surrounded by Helium, the wires will never oxidize or deteriorate. And the last - but not least, sine - unlike any vacuum - the Helium pressure is exactly the same as the atmospheric air pressure, there is nothing to force our Helium to leak, plus the tubes remain flexible, and the Dream cables are user-friendly - unlike all other "vacuum" cables (which are very stiff and inevitably lose vacuum with time - i.e. unlike the Dream, need periodical service to maintain the performance).